The Oregon Coast is home to spectacular beaches and wildlife, but it has some quirky sights worth visiting too. For those who love history, the short drive from Lincoln City to McMinnville is well-worth the effort. 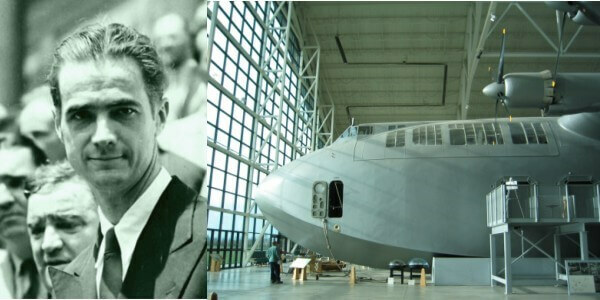 McMinnville houses Howard Hughes’ Spruce Goose, a gigantic flying boat built during WWII. The Allies needed a way to transport large payloads across the ocean. Eccentric billionaire Hughes and his engineers responded to a 1942 U.S. government request to build a cargo and troop carrier less detectable by Axis submarines without using critical wartime materials. Hughes and his engineers designed a flying boat to carry 750 fully equipped troops or two Sherman tanks over long distances. They crafted it from laminated birch, but the press gave it the inaccurate nickname, Spruce Goose. Hughes felt the name insulted the feat of the engineers and builders, and eventually renamed it the H-4 Hercules. Nonetheless, the name Spruce Goose stuck, despite his best efforts. Within two years, the U.S. government spent $22 million and Hughes spent $18 million of his own money on the project, and still, the plane was not finished due to Hughes perfectionism. The war ended, and so did the need for the aircraft. However, Hughes doggedly continued with the project. When completed, it was the largest flying boat and aircraft of the time. Many thought the plane would never fly. After all, a gigantic wooden aircraft wasn’t the norm. It was five stories tall with a wingspan longer than a football field. Despite naysayers and the aircraft’s monumental dimensions, Hughes proved the plane could fly on its maiden voyage in 1947. The Spruce Goose flew for one mile for less than a minute and then landed, never to fly again. Hughes obviously wanted to get it off the ground again as it was constantly maintained and in flight-ready condition tucked it away in climate-controlled storage for 33 years, but he died in 1976. The aircraft passed through many hands and eventually came to rest in the Evergreen Aviation & Space Museum. You can view this amazing specimen from American aviation history in McMinnville, and even tour the cockpit. This is one Oregon sight you must see in person to appreciate the scale of Hughes’ accomplishment. The D River in Lincoln City is also worth a visit, but this is one sight you might miss if you’re not careful. The Guinness World Records lists it as the world’s shortest river, but it’s nestled in the heart of Lincoln City and worth seeing. Even though the river is only 440 feet long, the beach area offers some of the strongest, steadiest winds in the world, perfect for kite flying. Two of the world’s largest kite flying festivals and a summer professional kite festival make the D River State Recreation Site one of the best places in the world to watch or participate in this mesmerizing past-time. Farther down the coastline, another must-see is the Devil’s Punchbowl. Devil’s Punchbowl State Park is at Otter Rock, about four miles south of Depoe Bay and nine miles north of Newport. This natural wonder created from two collapsed sea caves eventually eroded to form a foamy cauldron where waves crash and boil, spewing seawater upwards for an unforgettable show. If you’re careful, you can even stroll inside the cavern at low tide. This area is also one of the top ten places to spot whales on the Oregon coast, especially from late March to June. When visiting the Lincoln City and Depoe Bay area, many beautiful oceanfront and ocean view vacation rentals are available so you can appreciate Oregon’s beauty in comfort. These condos are rated “excellent” by Tripadvisor and FlipKey, sleep 4 to 6 guests, and make your visit to the Oregon coast affordable, comfortable and superior to a hotel stay.